Following the Let’s play! project participants in Lviv, Kramatorsk, and Kurakhove, 45 students from the Modern Education Academy А+ received the gifts. Each child was presented with the Nike branded ball by Yaroslav Rakits’kyy. – I am very happy to be here, – noted the back of Shakhtar and Ukraine national team. – I will tell it straight: Shakhtar kits suit each of you. I wish you grow up healthy and play football. I believe you will succeed. Later, the autographs, the photo shooting and the festive cake with logos of the Donetsk club and A+ Academy awaited those present. Let us remind you that it is the second joint event. 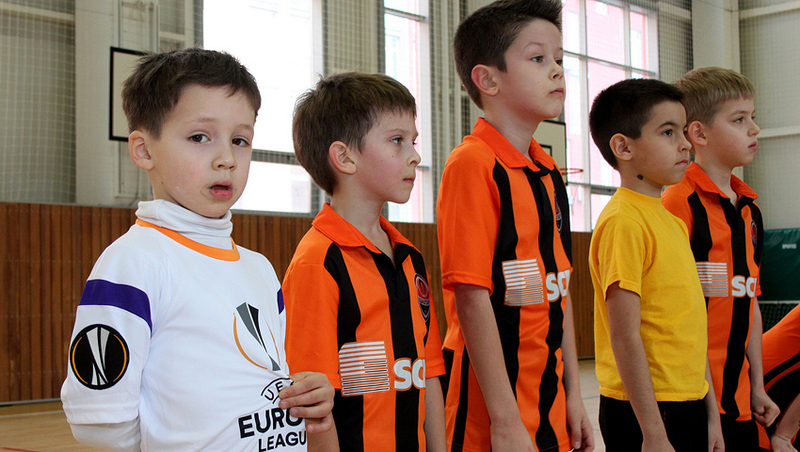 Between October 31 and November 5, FC Shakhtar and A+ Academy organised the football camp for the kids. Within a week, the Donetsk Academy coaches had been giving 2 classes a day to the kids. The students also attended a training session of Shakhtar, having a chance to see for themselves how the Pitmen were preparing for the crucial encounters. In the near future, the Let’s Play! project participants will receive New Year’s gifts in Donetsk.